We produce Certified organic milk for Organic Meadow a farmer owned co-operative (www.organicmeadow.com). We milk 35 Holsteins and Jerseys. Our milk, cheese, butter, sour cream,and yoghurt etc can be purchased at most natural food stores and super markets. Our cows, under the National organic standards, are turned out everyday and are fed organic grass, hay and grains. We do not feed Soy nor use antibiotics or spray chemicals on our fields. 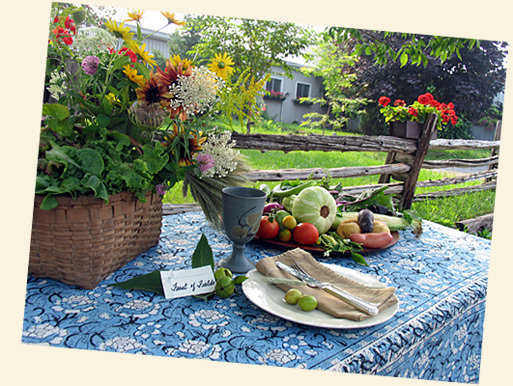 We are members of the National Farmers Union (http://www.nfu.ca/) and hosted the 2005 Feast of Fields(pictured right), an NFU event. We also belong to the Ecological Farmers Assoc of Ontario (http://www.efao.ca/). Both organizations work for many important issues such as preserving the family farm, preserving farmland, seed saving, re-creating sustainable local food systems, and education for ecological farming practices to name a few. organic turkey - order now for this fall! rporate more Bio-dynamic farming methods as well. Order�now for 2011!! Limited Quantities available.... we always sell out! Must be ordered early for Thanksgiving and Christmas Taking orders for 2011!